The Office of Youth and Young Adult Services was created to design, coordinate and promote innovative strategies to advance youth development. These strategies will cut across all disciplines at the state and local levels. The goal is for all New York State youth to reach their full potential and become healthy, productive adults. The Office of Youth and Young Adult Services supports and funds programs and initiatives that enable youth to build on their strengths. It supports programs that provide opportunities for youth to gain important life skills and core competencies, and that allow youth to have meaningful roles in their communities. Youth development initiatives benefit young people in their homes and neighborhoods, in schools, as well as in foster care and residential treatment. Partnership is key. Staff work collaboratively within OCFS and with other state agencies, youth bureaus, local governments, contract agencies, schools, public and private organizations, the faith-based community, and with young people and their families. 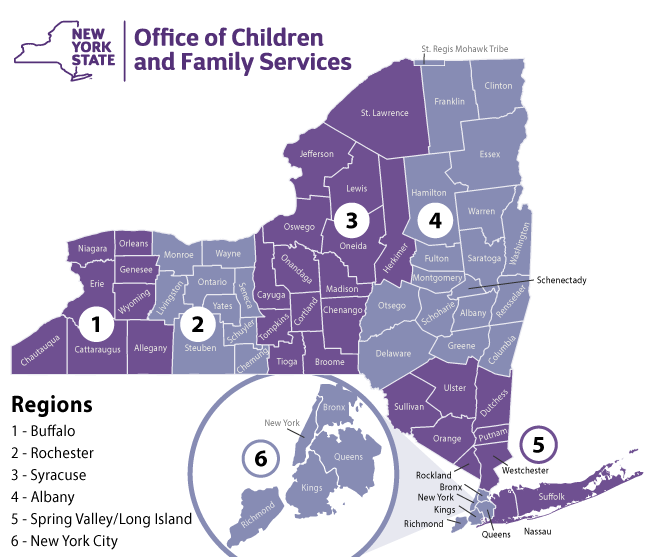 The Office of Youth and Young Adult Services continues to further support the youth development policy of the NYS Office of Children and Family Services. The agency contracted with the David P. Weikart Center for Youth Program Quality: A Joint Venture of the Forum for Youth Investment and High/Scope Educational Research Foundation to develop an assessment tool to gauge the features of positive youth developmental settings that is collected within our Quality Youth Development System. This was based on the eight features of positive youth development settings that have been established by the National Research Council. Select a county from the map or the drop down.